#3 - RotC #3: RaYzor's Funeral - "“Dr. Davies skills were considerable. But his defeat was sound!” | RaYzor’s Funeral"
"Norma... Jean... Muscle... heads... ugh..."
Chrusher recalls the recent defeat of Dr. Davies, then finds notice of his best bud RaYzor's demise! APRIL 27TH, 2006 UPDATE! : The rest of this issue was written, but never completed. The reason was so that I could draw the next few episodes (press "NEXT COMIC" button) that are extremely humorous (based on fan reaction), and my other project, the Towner comic strip. The loose ends in this episode will be answered later, as I will draw the rest either in recap fashion or flashbacks, as the comic is now over 10 years old and I have bigger storylines to fry. 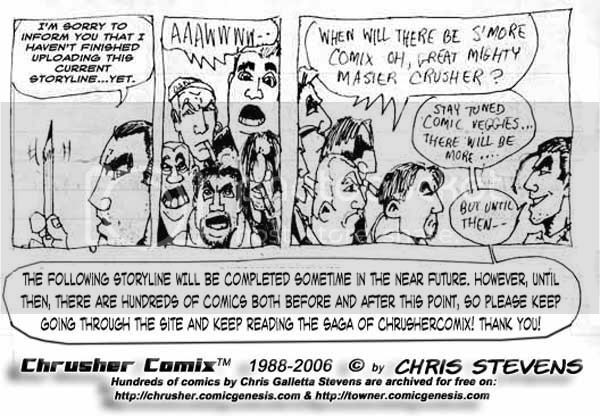 Until then, just read the next handful of issues... which were voted one of the funniest of all time by Scott Gagnon (it nearly killed him via laughter fits! ), RaYzor, and my brother. Of course, they kind of had influential input with the stories, so of course they're gonna' like it.